Remember that wonderful canning closet Don made for me last year by remodeling an unused bathroom? Well believe it or not, it's full. Stuffed. Can barely squeeze another jar into it. I was stacking boxes of full jars on the floor. But there was a little more space in this canning closet, namely a section along the far wall which also has a small window. It's only about two feet wide, but it goes wall to wall... which in this space is five feet wide. First thing Don wanted to do was cover the small window. Sunshine on canned goods isn't good. So he stuffed the window box with insulation, and fit a piece of OSB (oriented strand board) over the window. Because the window cover is merely screwed on, it would only take five minutes to remove it should we ever want the window back. Next he fit the corners and walls with 2x4 brackets to hold up the shelves. Ta da! Three more sturdy shelves for canned goods. It doesn't look like much from this angle, but the shelves actually extend behind the other shelving units, wall to wall. This gives me 30 square feet more of shelving space. Whoo-hoo! I expressed my gratitude for all Don's hard work by running his cell phone through the washing machine. Crud. A friend suggested he immerse the cell hone battery in a bowl of dry white rice for twenty-four hours, which he did. And you know what? It worked! The phone works perfectly and is even clean into the bargain! Phew! Covering the window was good for your canned foods. Getting more space is wonderful! That is funny/tragic about the phone, but it turned out great. I am glad to know that the rice trick works. Nice shelves. I had a basement when we lived in GJ, CO and my dad built me shelves down there for my birthday one year. LOVED those shelves! I washed Yeodfurt's phone one time. Didn't realize it until I had also run it through the dryer. We were both surprised, but it still worked. I guess the trick is making sure it is completely dry ...by whatever method, ha! that's one sweet canning cupboard! I have total envy for it. I'm about to make my own set of shelves this week. We'll see how it comes out as I am so not the carpenter type! Drooling over all your canning shelves! I need more badly. As for the cellphone I feel better knowing I'm not the only one to watch one. :) Did the rice thing too and was relieved. Glad the rice trick worked on Don's phone. I washed my husbands phone this summer and fried it apparently. I'm told the trick is to NOT turn it on and check it. Straight into the rice. 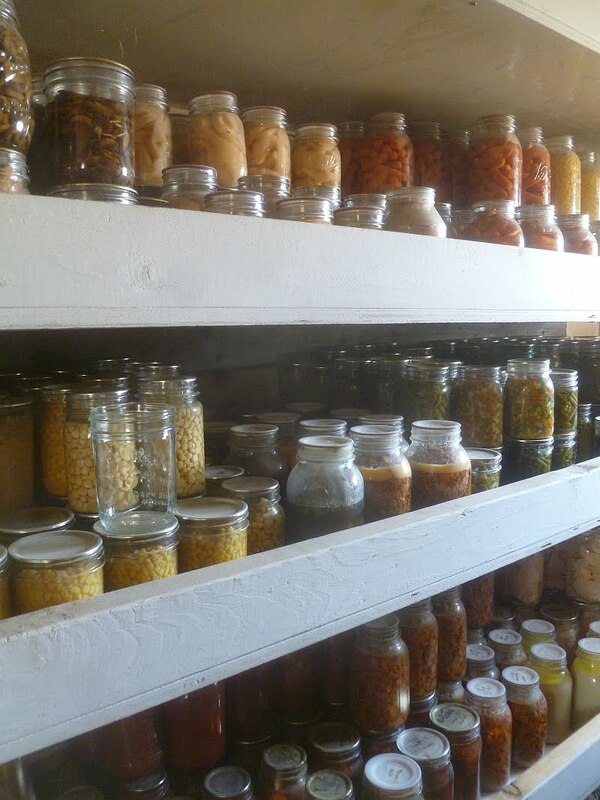 Also, LOVE the canning closet and all it's contents. It shows lots of labor and love. Your shelves look great! They will also be full in no time - I know how that works! Also, I washed my cellphone, and dried it, too, inside a jacket pocket. Someone also told me about the rice trick. I left mine in there for three days, and it was like new after sitting in the rice, too! I was amazed. One more suggestion that I was told - if your phone gets washed, be sure NOT to turn it on (to see if if still works) until after it dries in the rice. The sensitive connections inside can fry if they are still damp. Congratulations on the new addition. Your pantry looks nice and the food is the result of hard work I am know. Sometimes it is good to be lucky and thanks to the rice he has a clean phone that works. You are blessed to have a husband who doesn't procrastinate and makes your living and working space really nice for you. My husband, bless his heart, is a high school woodshop teacher and has all the skills and tools to make me wonderful things. The island for our kitchen has been "almost" finished for a whole year; just some sanding and painting left, but, alas, he's "too busy" to do it. Your shelves are wonderful! Having organization and ample storage space is so important in rotating your food store. Having all your canned jars where you can also see all your beautiful bounty and reflect on all the work you performed over a time period, is so rewarding and comforting! Thanks for sharing the cell phone rice trick with us. I have made it a compulsive habit to check my husbands pockets before anything goes in the wash.
As a result, I have about 5 lbs. of assorted hardware and loose change, now sitting in a bowl in the washroom. I don't have far to look when I need a nail or a spacer washer! Generally, dunking electronics in fresh water isn't that big a disaster-remove the battery, leave the cover off and put it in a warm area(I used to use the shelf over the water heater,which was in its own closet under the stairs)until it dries out. Most circuit boards are coated with some type of clearcoat(at least on the "solder side"),and are partially water-resistant. As long as it hasn't been submerged a long time, it's probably OK.
At my last job, I used to wash off circuit boards(from industrial laundry controls,and boiler controls) in the sink with warm water and Simple Green-never had a problem with it. Salt water is a different story. I have a wonderful husband, too. He's more than willing to help with projects in our home - especially when they deal with food. Your pics show some jars that have jars on top of them and some that don't. Some jar bottoms don't sit securely on jar tops - particularly if you're using a regular jar atop a regular jar. Sighing admiringly with glowing smile....time for me to get to work on mine. I love it when you do a project because it makes me feel like I accomplished something! I am adding a wooden crossbar to each of my shelves to serve as a bumper to keep the jars from falling off...now that we have been feeling earthquakes and hearing the glass rattle and seeing the jars shake out to the edge just daring to go splat and make a huge mess! Who would have thunk it...earthquakes in tornado alley! covering the window in your pantry was a good "ops" move...now the golden hoard wont be peeking in and seeing what you have. it is amazing how fast a person who is canning and preserving can fill those shelves. i have been doing it for years using a large walk in closet on the cool side of the house..it stays full or almost full most of the time. for now it is great when i do not feel the need to run to town for groceries...and it is great when we have weather and power outages that can trap us in for a long time. Your new shelves are lovely. And your entire canning closet is a thing of beauty. All those jars of food must be a real comfort to have on hand. You and Don are a great team. What cell phone services work in your area of Idaho? We have AT&T. When we were in Idaho this summer CDA was about the only place I had service. My contract is up in a year. I want to switch at that time to a company we can use when we move to Idaho. Will probably be back in your area this coming summer. I have a friend that has 40 acres near your area. We are hoping to go visit their property and look around more ourselves. Stuck, we use Net10/TracFone (I think they're now owned by the same company). We seldom use our cell phones unless we're on the road, so the limited number of minutes we purchase per month is more than sufficient for our needs. You can also stick your wet phone into the dehydrator overnight. We've done this with success more than once. While I'm glad you were able to recover the phone by drying it out I would have concerns that corrosion will have reduced its reliability and life expectancy. Hopefully you don't rely on that phone for things like 911 calls. Except for the part about getting my cell phone laundered. I can get by without that. Stuck in CA, we live north of CDA and we use Verizon Wireless. We had ATT when we first started coming up in 2002 and it sucked. Our joke was that we had to climb the nearest pine tree to get any service. We have no land line, only VZW cellular and it works in 98% of the area. My mom washed her phone once. Shay took it apart as much as he could, and set it on a shelf in the middle of the den. After a week, it turned on. After three weeks, it was back to normal. Nice to know about the rice, though. And the dehydrator... I would like one of those. My son's phone was washed several times and lived to my delight. The bad thing though is that there is a patch on the battery that changes color if water touches it. This voids the warranty of the battery. At least the phone works though!! Love your pantry!! Wow, what a fabulous job you have done canning. Congrats on the pantry security! Your pantry looks nice and the food is the result of hard work I am know. Sometimes it is good to be lucky and thanks to the rice he has a clean phone that works. The kitchen and pantry looks neat and clean. Thanks for sharing your effort and hardwork.